They know that I completely love and accept them (LGBT community), as I do all people. I’ve struggled enough in my life to be appreciated and understood. I’ve had to go against all kinds of people through the years just to be myself. I think everybody should be allowed to be who they are, and to love who they love. I don’t think we should be judgmental. Lord, I’ve got enough problems of my own to pass judgment on somebody else. We are not nearly so much interested in hearing about God as we are to know how soon we may expect the loaves and the fishes. Our beloved Master, however, understood this human trait and was tenderly patient with it, just as those to-day who are endeavoring to follow in his footsteps by helping others should remember to be. Although Jesus was in the midst of speaking to them those wonderful words of Truth which would bless them much more than any material thing he might give them, yet he could pause long enough to minister compassionately to that which, to their still unenlightened sense, was the acute need of the moment. Surely there must have been many healed on that occasion of the belief that material supply was the most important thing in life, just as the one to-day who turns to Christian Science to get something will soon find, as he progresses, that the question he must daily ask himself is not, What can I get? but, What can I give? Speaking absolutely, man cannot get anything, for as God’s reflection he already has all. It is obviously impossible to get what one already possesses. One’s real work, then, is not to get something which one has not, but to give something out of the abundance which he already has. One’s real work is to realize the forever truth of the words of the father in the parable of old, “Son, thou art ever with me, and all that I have is thine.” So-called mortal mind, however, would reverse all this, just as it would reverse and change all that is really true; and so we, in turn, must refute its lying arguments as fast as they present themselves. But, some one may say at this point, I do not see what all this has to do with my problem. It sounds very well, but how does it apply to me? It is not ideas I am looking for, but work. How do you make all this practical to everyday needs? Do you mean to say that I must stop trying to get a job? Yes, is the reply, you positively must. You must stop trying to get a job, and look instead for an opportunity to give your services. Suppose that a solicitor starts out in the morning with the grateful realization that he is not going about all day to get, but to give. In the first place, he himself must be sure that whatever he has to sell, whether it be a washing machine, an automobile, or a cake of soap, is a good washing machine, a good automobile, or a good cake of soap; that it is exactly as he represents it to be; that the price is right, and his firm reliable. He should be convinced in his heart of all this; for if it is not true, he cannot expect Christian Science to give him any aid. If he sincerely believes that his commodity is all right, and that any one investing in it will be helped and blessed thereby, how differently he can go forth compared with the time when he was simply hunting for some one to buy this thing so that he might get some money! Then he was working to get an order; now he is working to give a blessing. A very young student of Christian Science once sold a Bible encyclopedia throughout what was called a hard, cold winter, but it seemed neither hard nor cold to the worker. Each morning she went forth filled with joy because she had so much to give. She had entire faith in the merits of her book, and her feet fairly flew as she went from house to house carrying with her the good news of an opportunity to understand the Bible better. Although the work was entirely new to her, it was successful from the outset; and when at the end of a year she gave it up for other work with larger opportunities for service, she looked back with gratitude to recall incidents without number wherein she had been able most unexpectedly to speak a word of comfort and cheer to some discouraged one, as she went her happy way, thus giving each day something from her new-found store of Love’s abundance. What a beautiful world this would be if every one in it would start tomorrow on his daily round of work, carrying with him this thought of giving! While we cannot at once change and revolutionize a world still deeply stupefied in its mesmeric sleep of centuries of wrong thinking, we can at least so clarify our own mental home of its false education along this line that the deep desire to serve will after a while become the dominant factor in our lives,—to give as it hath been given unto us, through this better understanding of God and of man’s relationship to Him. Has a teacher been deluded into believing that she must get some pupils, in order to get some money, in order to get along? What a joyous, restful thing it would be if she would only reverse all this, and look for an opportunity to give of her best efforts to help some one struggling to bring out some latent talent, whether it be in music, art, or literature, to help and instruct and encourage, and show him, in turn, how to give out the best that is in him for the sake of giving joy to others! Has some one been trying to get a tenant for that long-vacant room? Then stop right there. Man is not in the getting business. Man gives, because God gives, and man is God’s reflection. Let the one who has vainly been trying to rent a room reverse her attitude, and realize that there is some one to whom the warmth and good cheer and comfort of her home may prove a blessing, some lonely and homesick one, perhaps, to whom the home of a Christian Scientist would seem like heaven on earth,—as indeed it should be. Can she not forget her own seeming need in her pure desire to reflect sheltering love and protection to some one else? Shall it be said of any of us, to whom so much has been given, that we get but do not give? Of the barren fig tree it was said in the parable, “Cut it down.” A fig tree without fruit is like a man with only words; and for this type of mentality our Master had scant respect, as the words, “Why cumbereth it the ground?” imply. Why, indeed, since it was getting sunshine and the dews of heaven and “the early and latter rain,” and space to grow in and light and air, and yet gave no fruit in return? From his point of view it was as dead as it ever would be. Let us to-day prove our right to say, “I live,” by expressing that which is its own evidence of immortality. Only as this is done shall we be followers of him who “went about doing good,” and who pointed to his works, rather than to his words, as the proof of his unity with God. Thus shall we find our own needs met, and usually in a manner far beyond our highest hopes; for the one who knew more about giving than any one on earth once said: “Give, and it shall be given unto you; good measure, pressed down, and shaken together, and running over, shall men give into your bosom. For with the same measure that ye mete withal it shall be measured to you again.” Then let us stop looking for jobs and music pupils and roomers and customers, and look instead for opportunities. 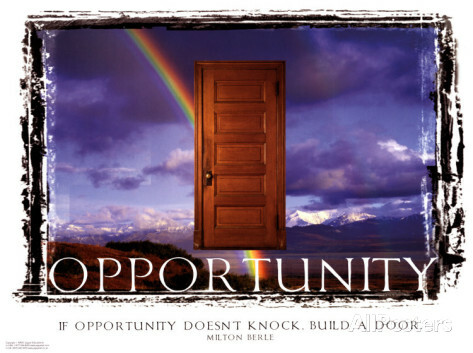 The well-known saying that opportunity knocks but once at one’s door is utterly repudiated by Christian Science, which teaches that opportunities come daily and hourly, and in just the same proportion that one looks for them and longs for them and uses them. To the real Christian Scientist opportunities appear with each new day; and he gives as does the sun of its sunshine, whose gentle touch warms the earth into new loveliness with each recurring spring. The sun is always giving, and the earth looks up in glad response, and gives back its gratitude in glowing harvest fields, in huge forests of timberland, in vast areas of golden fruit, all affording their quota of supply for human needs. As we, in turn, go on our quiet way among our fellows with this pure desire to give, as does the sun, impartially and unreservedly, to high and low alike, to just and unjust, rich and poor, good and bad. we shall find that even as the winter snows melt before the smiles of April, so will barren and loveless and sinsick hearts change at our coming into new usefulness and beauty. The world unconsciously feels the sweetness and warmth of the one who longs to give from out his store of love for God and man, and is quick to make response. Then let us stop worrying; let us stop doubting and distrusting God, and find our own needs met through blessing others. The way will surely blossom as we go; for there is no path more fruitful in which to tread than that which is carpeted with the fallen leaves of forgotten self.